Sign up for our weekly newsletter! Book Fair! Box Tops Contest! Fall Festival! Upcoming! Due to the new EzEnroll system we can no longer receive your email address from the main office. Thank you! PLEASE NOTE THAT SEATS MAY BE LOCATED IN NEARBY BALCONY SECTIONS. IF YOU WANT TO ENSURE SEATS WITH CERTAIN PEOPLE, ONE FAMILY SHOULD ORDER ALL OF THE TICKETS FOR THE GROUP. • Make sure to complete all lines on the form. Incomplete forms will not be fulfilled. • There are NO REFUNDS or EXCHANGES on tickets. • Submitting an order does NOT guarantee tickets – they are first come first served, and will sell out. Please save the date for this year’s Scholastic Book Fair! October 24 and 25, 2018. 2pm-8pm. Sign up to help! Sign up to help at the book fair HERE! Our next Box Tops contest deadline is fast approaching. The classroom and the student who collect the most Box Tops will win a prize. Each year Box Tops provides nearly a thousand dollars for our PTO. It is easy to help us raise these funds. All you have to do is take a look at the products already on your pantry shelves. 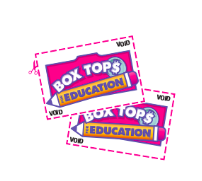 Clip and collect the box tops as you use the products, and check your shelves for any box tops that are expiring soon as once they expire, we can’t collect money for them. You can attach the box tops to Click on this submission form! or even easier, put them in a ziplock bag. Once you have them collected, send them into school with your child – Don’t forget to label with your child’s full name and classroom. For a list of participating products see the product list found in the Lilja School virtual backpack. The deadline for your submissions is Friday, October 26th. Stock up on fall Lilja gear and some remaining summer items in the online Lilja store. FREE SHIPPING TO LILJA. Click here to visit. Newer PostSign up for our weekly newsletter! Book Fair! Box Tops Contest! Fall Festival! Upcoming! Older PostVolunteers Needed for Our Events! Lilja Night at the Celtics! Book Fair! Box tops contest!